What would you call a car with a single minded focus and clear intention of being the ultimate road-legal track car? And how ‘ultimate’ are we talking? Well, how about a 588kW, 800Nm 4.0-litre twin-turbo V8 inside a lightweight carbon body with active aerodynamics, active chassis control and a staggeringly high 800kg of downforce. We’d call it uncompromising. McLaren has chosen to call it the Senna. Like so many other aspiring race drivers, Ayrton Senna was my childhood idol. The Brazilian had a single-minded, uncompromising approach to racing that has become legend. Now, can you believe it, I’m at Estoril in Portugal, the scene of my hero’s first Formula One win to put a McLaren hypercar bearing his name through its paces. McLaren Senna — I think I need to pinch myself! The names are synonymous. Many of us are of an age that when you think of one, you inevitably think of the other. Who could forget the Kiwi-founded UK F1 giant’s racetrack dominance in the late 1980s and early ’90s. It stands to reason then that any car that bears the Senna name has to be pretty special. It has to exhibit the same qualities as the great man himself. Put simply, it has to be the best. With the Senna, McLaren seems confident it has captured these characteristics in its latest offering and on paper I’d have to agree. The McLaren Senna’s statistics are simply staggering. So staggering, that it’s difficult to grasp or have any sort of perspective on them – unless, of course, you’re a race driver. I guess that’s where I come in. In my ‘day-job’, I’m often asked during a hot-lap or taxi ride session how a particular car compares to a racecar. The truth is, as good as the best road cars are, they don’t have anywhere near the same performance as their racing counterparts. And when I say anywhere near, I really mean they are light years away. With its combined heritage perhaps the McLaren Senna is the car that can change all that? The key to making any car fast is keeping the weight down. Not having to accelerate, turn and stop extra kilograms can more than make up for any inadequacy in power. To give you an idea, the addition of a passenger can add over a second to lap times around even short circuits. 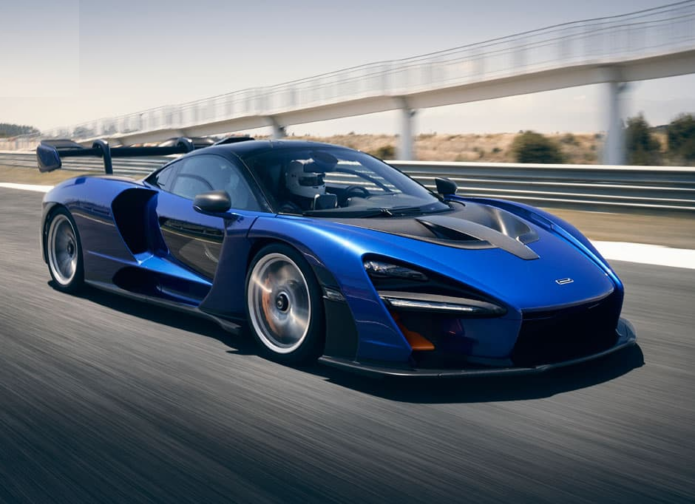 The McLaren Senna is therefore the lightest road-legal car McLaren Automotive has built to date. Its dry weight is 1198kg, a figure that’s been achieved through ever-advancing carbon-fibre technology. This car forms part of what McLaren call its Ultimate Series (in contrast the 540C and 570S ‘entry-level’ McLarens are dubbed Sport). This is a category of car where McLaren gifts its engineers a little more rope in terms of budget and the opportunity to experiment with new ideas. There are myriad examples of the diet McLaren’s put the Senna on. The seats, for example, feature a hollow double-skin shell structure that creates a seat that is both stiffer and lighter than ‘normal’ carbon-fibre buckets. At 3.35kg, McLaren’s engineers reckon the Senna’s seats are a third lighter than the same seat using conventional processes. They save an extra 475g buy only using foam at the “high pressure points” of a seated driver. In the Senna, the carbon-fibre chassis is also even lighter than its already gram-conscious Super Series counterparts. McLaren is so proud of its advancement in this arena, it’s moving its carbon tub manufacturing away from Germany to England to better protect its IP. The lightweight philosophy is all encompassing. In the Senna, every aspect of the car challenged to be lighter. This applies to the choice of powertrain and the absence of hybrid battery power. Too much weight, without adequate return in power, the experts state. Even the starting battery is a lightweight lithium-ion unit. Downforce has a huge effect on lap time too and just to look at the Senna highlights the extreme measures McLaren has gone to bring extra to the table. I wouldn’t say the Senna is the prettiest car ever built, but it makes no apologies for its styling. What this McLaren sacrifices in looks compared to, say, the jet-fighter lines of the 720S, it more than makes up for in purpose. Make no mistake; this car is all about aerodynamics. McLaren claims it makes an immense 800kg of downforce at 250km/h. This is a statistic that needs some perspective. Our Aussie Supercars make around 300kg and the high ‘G’ GT3 race cars of the Australian GT Championship effectively double that to around 600. Most road cars, in contrast, actually have ‘lift’ — the opposite of downforce. Even high end sports cars barely cover off this lift or make just a tiny bit of actual downforce. Fact is 800kg on a 1200kg car is serious. You maybe asking why the maximum downforce is quoted at 250 km/h, when the McLaren Senna’s top speed is well past the 300km/h mark? Two things… Firstly, the Senna gets DRS or drag reduction system — a system where the rear wing flattens out at high speed reducing drag. The other and most interestingly — it rolls (obviously) on road tyres… They are, perhaps, the Senna’s only compromise. If left to its full potential, above 250km/h, the downforce generated by the Senna’s unfettled aerodynamics would overload the tyres and suspension to dangerous levels. Thus the engineers have had to design systems to bleed it off. The rear wing makes the majority of the downforce and is a serious piece of kit in its own right. It’s extremely light at only 4.7kg, yet it is also so strong it can support over 100 times its own weight in aero load. We often hear (and use) the term balance when describing a performance car’s handling. What that actually means is that when pushed just beyond the limit, the car may exhibit an understeer, oversteer or neutral balance. Neutral is perfect, meaning the front and rear axles slide together equally; or the car may have a little bit of understeer here and a bit of oversteer there. More often than not, it’s the suspension characteristics that influence the balance but with a car like the Senna with so much downforce, the ‘aero’ balance is even more important. Engineers deal with what’s called the centre of pressure; the balance point for downforce. Move the centre of pressure forward and the car has more front balance, back and it has more rear. It’s complex and made more so via the fact the pressure point moves with the pitch of the car. Indeed, aero loads can move significantly, sometimes making for an unpredictable car as the loads shift forward or rear unbalancing the car. In an ideal world, keeping the car’s platform level and maintaining a predictable centre of pressure location inspires driver confidence and speed. The McLaren Senna operates in that ‘ideal’ world. Aerodynamically, the front and rear wings change their angle of attack and the suspension responds to chassis movement and keeps the car level. It’s easiest to describe how this system works into a braking zone. Down the straight, the rear wing will be in DRS mode — flattened out. When the driver hits the brakes, the centre of pressure would normally shift forward by increasing ground effect at the front as the nose dips, increasing positive rake on the chassis and making the rear unstable or lighter. In the Senna, however, the rear wing actually increases its angle of attack while the front wings reduce their angle, effectively keeping the aero balance or centre of pressure stable. The rear wing also eventually goes into ‘air brake’ mode, snapping to a huge angle that makes significant drag assisting braking performance as it does so. The rear wing can move through 35 degrees and the front winglets 40. Keeping the platform level is not solely the wing’s responsibility; the McLaren Senna’s suspension is also active. Indeed, the Senna combines the Race Active Chassis Control from the McLaren P1 in combination with the Proactive Chassis Control 2 from the 720S to create ‘Race Active Chassis Control 2’. It’s a very clever system that effectively senses load through the wheels before the chassis ‘feels’ it, then adjusts the displacement of the suspension accordingly. Statically, the car sits at a road legal ride height then at speed adjusts to minus 39mm at the front, minus 30 on the rear and can reduce to minus 50mm! with full aero load. Both systems are extremely fast reacting and are undetectable by the driver. Given the amount of race-style tech in the McLaren Senna (and its rarefied title) my expectations of this road going weapon are that of a race car — understanding fully that it still rides on a road tyre, albeit a bespoke version of Pirelli’s Trofeo R.
The aero figures are so impressive that I’m thinking they will more than make up for the tyres’ limitations. But the reality is it doesn’t. While I can tell you the Senna is quite a leap from the extremely quick 720S (our warm up car), it is at its core still a step or two away from being a legitimate racer. And it’s much of that is down to not having a slick tyre. Bring on the Senna GTR! All that aside, what’s really impressive about the McLaren Senna is how easy it is to drive. The power delivery is very smooth. The Senna’s 588kW 4.0-litre twin-turbo V8 doesn’t hit with any sudden burst of power and just gets on with the job with no fuss. It’s only when you glance at the speedo that you realise you’re pulling big numbers. It’s fast — very fast — but it does it effortlessly. The Senna is also predictability and its balance is a highlight. The turn-in capability is strong and through the tight, twisty stuff at Estoril, getting the power down was the only limiting factor. This is understandable with 800Nm of torque in car that weighs about as much as a Fiat 500. We were required to run the car in ‘Race Mode’ which leaves the stability control on. I did find it a little too much on the conservative side but in McLaren’s defence it’s perfect for a broad range of skill levels. Having said that, it still keeps you on your toes with its responsive corner entry and on exit the car has some oversteer freedom. The brakes were one of the Senna’s best feature. McLaren says it can stop 16 metres shorter from 200km/h than the McLaren P1. Indeed, in combination with the active aero, the huge carbon ceramic brakes work an absolute treat without a hint of fade. I could brake at the 180m mark into Estoril’s tight right-hand Turn 1 from close to 290km/h every lap with absolute confidence. It’s pretty quickly apparent he best way to get the most of out this car is to brake late, slow the car and ‘V’-off the mid corner phase to get the car straight on exit. With a power to weight ratio approaching 500kW per tonne (ie: your Commodore would have to have over 900kW to match it), the straight line performance of the Senna is serious (from a standstill it accelerates to 100km/h in 2.8sec, to 200km/h in 6.8 and on to 300km/h in 17.5! ), so anything you can do to help put 800hp down to the ground is a good strategy — particularly in the slow stuff. You really feel that this car excels in the high-speed corners where the aero loads come into their own. Estoril has too many slow corners to show it off at its best but this car would be absolutely sensational at a flowing track like Phillip Island. Perspective time again… Around Estoril, the McLaren Senna is only 1.5-2sec away from a GT3 racecar’s lap time. At most circuits in Oz, that puts it at roughly V8 Supercar pace – on street legal rubber. It’s fair to say it’s seriously fast but like most hypercars, the McLaren Senna achieves much of its speed in a straight line. Still, I had to keep reminding myself that it has rego plates! McLaren says its aim with the Senna was to offer the purest connection between car and driver ever delivered in a road car. I think it’s achieved it. This McLaren is uncompromising and unapologetic, yet it is also confidence inspiring and remains accessible to all (well, most) skills levels. It’s easy to drive and just plain, properly fast. A proper racecar? Not quite but it’s getting closer. How much is the 2019 McLaren Senna?